Rumor: Sarah Palin said vaccinations may cause homosexuality. Claim: Sarah Palin said vaccinations were linked to homosexuality. 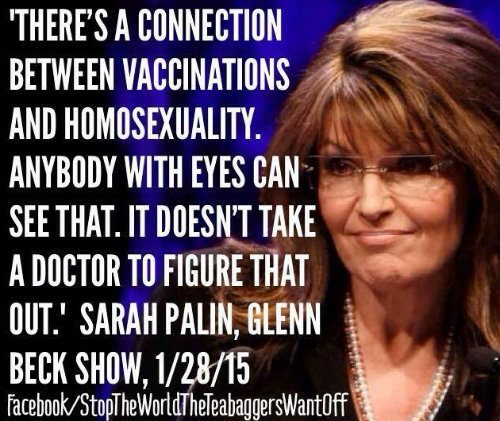 Did Sarah Palin, while on the Glenn Beck program, say that vaccinations caused homosexuality? There’s a connection between vaccinations and homosexuality. Anybody with eyes can see that. It doesn’t take a doctor to figure that out. But the former Alaska governor said no such thing. The “Stop the World” Facebook group is a satirical one that frequently attributes fictitious quotes to conservative politicians. On 1 January 2014, the group claimed Palin made offensive comments about “white privilege,” and on 13 January 2015, the group attributed a dubious diatribe questioning Michelle Obama’s feminine qualities to Mitt Romney.